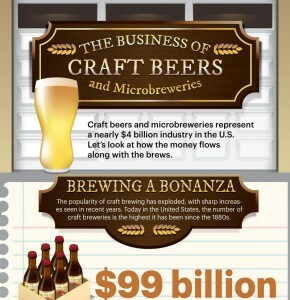 Craft beers and microbreweries represent a nearly $4 billion industry in the U.S. Let’s look at how the money flows along with the brews. The popularity of craft brewing has exploded, with sharp increases seen in recent years. Today in the United States, the number of craft breweries is the highest it has been since the 1880s. Homebrewing can be the most cost-effective way to drink good beer over the long haul. Basic beginners’ equipment kits start around $80, and ingredients cost about $25 to $45 per 5-gallon batch. Now that you’ve got your materials and ingredients, you’re ready to become a brewmaster. Use a rolling pin to crush the crystal malt in a plastic bag. Then pour 2 1/2 gallons water into your brew pot, leaving at least 3 inches to the top of the pot. Add your crushed grains. Turn on the heat to medium high and bring the temperature up to 150 to 155 degrees. Turn off the heat and cover the brew for 30 minutes. Use a strainer to remove as much of the spent grain as possible without worrying too much about a few remaining grains. Bring the contents of the brew pot to a boil. Then, remove from heat and stir in the malt extract. Return to heat and again bring to a boil. Once you have a controlled boil, add about 2/3 oz of the hop pellets to the boil and maintain the boil for 60 minutes. Turn off the heat and add the remainder of the hop pellets. Cover and let the newly added hops steep for 10 minutes. Pronounced “wert,” wort is just another name for unfermented beer. Quicker is better when it comes to cooling. Create a cold water bath in the sink to partially submerse the brew pot in. Pour your cooled wort through your sanitized strainer and funnel into the empty fermentation bottle. You’ll want the total volume in the fermenter to be 2 1/2 gallons. If that means you need to add water, tap is fine. Once the wort is at room temperature, pour half of the yeast package in. Place the fermenter in a cool, dark place for 7-10 days. Boil 3/8 cup of sugar in 1 cup of water for 5 minutes. Cover and let it cool some, then pour into a sanitized container large enough to hold your beer. Now siphon your beer from the fermenter into the bottling container, being careful not to disturb too much sediment at the bottom of the fermenter. You are ready to bottle your beers. Remember to let them age in the bottles in a cool, dark place for 7-10 days. Congratulations, you’ve just made your first batch of brew. Now kick back and enjoy.